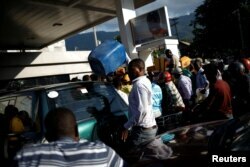 Motorbike riders and car drivers wait to get fuel at a gas station in Port-au-Prince, Haiti, April 7, 2019. 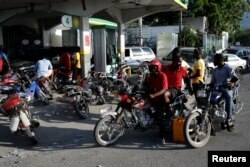 Motorbike riders and car drivers wait to get fuel at a gas station in Port-au-Prince, Haiti, April 4, 2019. 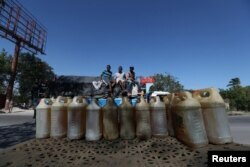 Containers filled with fuel that is sold on the black market are offered in a street in Port-au-Prince, Haiti, February 24, 2019. Motorbike and car drivers wait to get fuel at a gas station in Port-au-Prince, Haiti, April 7, 2019. Picture taken April 7, 2019. 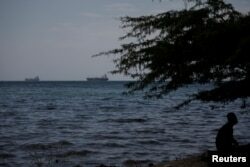 A man sits under a tree as two vessels are seen in the bay of Port-au-Prince, Haiti, April 12, 2019.